Rare ocean/lake view luxury condominium located in the center of Pleasure Island . Very spacious and comfortable at over 2000 sq feet. Upscale throughout. 4 bedroom, 3.5 baths. Sleeps 10. The top floor as a Queen master suite with a flat screen tv, a private master bath, half bath, gourmet kitchen, granite counter tops, stainless steel appliances, wine/coffee bar, dining/living room, large flat screen tv, beautiful furnishings with custom lighting, and a ocean view balcony with incredible ocean views. The lower floor has 2 tastefully decorated queen bedrooms and 1 bedroom with 2 twin beds. 2 full baths are located on this level as well. 2 of the 3 bedrooms have flat screen tvs. There is a lake view balcony off the rear bedroom. Separate heating and cooling zones. Private garage with elevator that services each floor. Located on a semi private street across from the ocean. Just a few steps to the beach access. Take a short stroll to the boardwalk and enjoy the thrill rides, listen to live music at the pavilion, grab a slice of Frank's pizza, have a Britt's donut (rated #2 donut shop in the nation), chocolate-covered strawberries from the Fudgeboat, and watch the fireworks at dark. Highly rated restaurants preparing some of the finest seafood on the east coast are just minutes away. Or just stay in and view the fireworks from your ocean-side balcony. If being on the beach all day isn't enough, walk across the street to the lake and rent a paddle boat, let the kid's play on the playground, or sit at one of the gazebos located on the water. Take a ride down to Ft. Fisher and walk through the civil war museum (look for info on the Ft. Fisher Hermit) or go to the NC Aquarium at Ft. Fisher. The live oaks at Ft. Fisher is a perfect back drop for photos. Or go sea shell collecting here. Water sports are in abundance nearby with charter fishing, jet ski rental, surfing lessons, and sea kayaking. Two challenging golf courses are less than 10 minutes away. Whether it is sunbathing on the beach, renting scooters or a golf cart and sight seeing, or watching a free outdoor movie on Sunday nights at the Lake (located just across the road), there is lots to do on Pleasure Island and this condo is right in the middle of it all. Great house for the entire family!!! This house was a real treasure and had EVERYTHING we could possibly need in addition to an extremely attentive and knowledgeable home owner! The home was clean, quiet and safe. It also had an elevator which was a real plus with all the stuff we had to carry in. We will definitely be back! Luxury Property with lovely views! Close to everything! One of the nicest properties we have ever rented! Best value for sure!!! We enjoyed the stairs - allowed for more beer! We had a total of 6 guests staying for 5 days at the Big Blue, all guests slept comfortably in their own rooms. Photos on the site are accurate and the home is lovely. Our host, Roger, needed some reminders in responding to messages and sending the Welcome Letter, but during our phone call prepping our group for our stay he was incredibly helpful and welcoming. The home is a 30 second walk to the beach, plenty of beach essentials were available to us to use during our stay. The boardwalk, bars, shops and a lovely local veggie market were within a 5 minute walk. We were told there would be some toilet paper available to us but that was inaccurate - so be sure to pack the essentials! The only other minor complaint we had was a few light bulbs were burnt out and needed replacing (twin bedroom, twin bedroom porch). I definitely recommend staying at Big Blue and hope my group is able to again in the future! The place is outstanding in side and a great view on the deck. Plenty of room for my family - 7 people all over the age of 21. Close to everything an extremely short walk to beach. Plenty of chairs, grill and house fully stocked with pots and pans. The appliances are family grade and not beach rental quality. We loved it, would rent agian next year. Great location, lots of space, close to beach and very clean. We welcome the opportunity to rent again. Best vacation home in Carolina Beach! This is the 2nd time we have stayed at Big Blue and couldn’t have asked for a better vacation home. 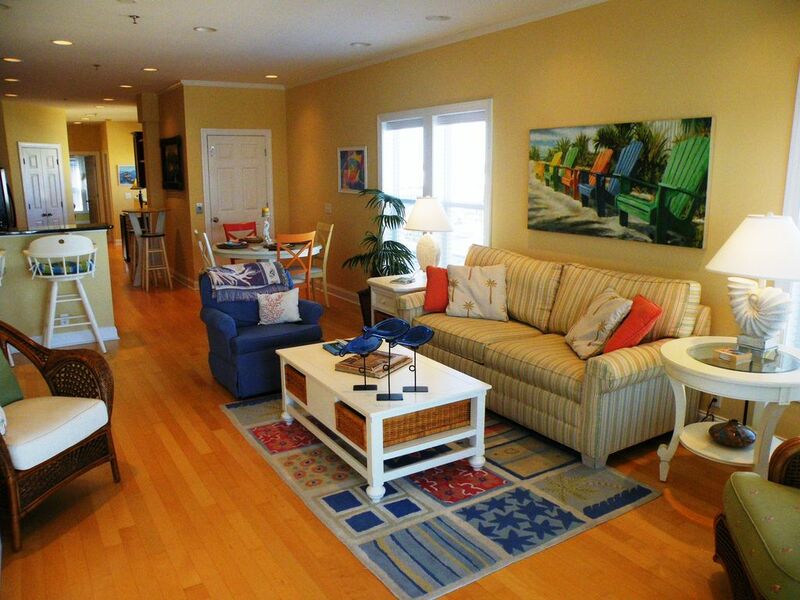 It is in close proximity to the Beach, boardwalk and literally, everything in town is in biking or walking distance. We spent many enjoyable evenings out on the deck visiting with Family and enjoying our view of the ocean. The inside is clean and taste fully furnished, with all the amenities we needed to have a great vacation. The owner is very accommodating and easily accessible. Would highly recommend! Located on a semi private street across from ocean front. Only steps to ocean access. Take a short stroll to the boardwalk on a Thurs. evening and hear live music at the pavilion, grab a slice of Frank's pizza, have a Britt's donut, and watch the fireworks at dark. Or just stay in and view the fireworks from your oceanside balcony. If being on the beach all day isn't enough, walk across the street to the lake and rent a paddle boat, walk around the lake, kid's can play on the playground, or sit at one of the gazebos located on the water. Take a ride down to Ft. Fisher and walk through the civil war museum (look for info on the Ft. Fisher Hermit) or go to the NC Aquarium at Ft. Fisher. Rather it is sunbathing on the beach, renting scooters or a golf cart and sight seeing, or watching a free outdoor movie on Sunday nights at the Lake (located just across the road), there is enough to do on Pleasure Island and this condo is right in the middle of it all.